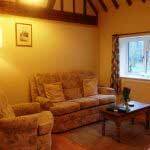 3 Byre Cottages has an original Victorian, slightly uneven, stone step of approx 6ins/15cm into the cottage. This holiday cottage features a hallway that leads to open plan living/dining room with kitchen off. 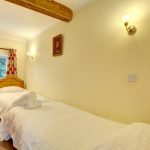 The cottage has one double bedroom (5ft king size bed with memory foam mattress), one twin bedroom (two 3ft/90cm beds) and a bathroom with a shower over bath. 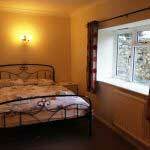 In 3 Byre Cottages the double bedroom is the larger bedroom with space to accommodate a folding bed. Folding beds can be provided by arrangement. This cottage has a South (the sunny side!) facing patio with barbecue and furniture. Parking. 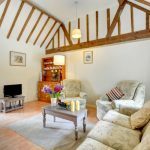 These super holiday cottages at Sullington Manor Farm, all offer self-contained, single storey accommodation and facilities include everything to make your holiday comfortable. 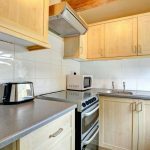 Each holiday cottage has a combination boiler to provide hot water at all times and central heating when you want it, a gas cooker, microwave oven, fridge/freezer, TV, DVD and wi-fi. 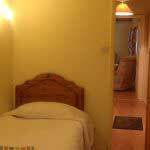 Bed linen and towels (one hand towel, one larger towel per person; please bring your own beach towels) are provided. Fuel costs are included from June to September. The holiday cottages share a communal laundry room with washing machines, tumble dryers (operate with 50p/£1), ironing facilitie and garden furniture.